Billington's Demerara Sugar is a crunchy, golden sugar with a rich aroma. Ideal in beverages, especially coffee and iced-tea. Suitable for baking and as a crunchy topping for desserts especially cookies, creme brulee, cakes and pies, for a perfect finish! 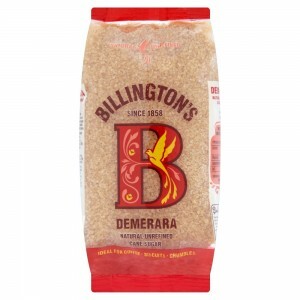 Billington's sugars are unrefined - they lock in the natural sugar cane molasses, rather than refining it out, so you can really taste the difference. This sugar is unique in richness, depth of flavour and natural colour. Billington's has been operating since 1828.